Fiction sometimes depicts fantastical lands and strange creatures. Other times, it will take a typical setting, twist it slightly, and produce a new take on a familiar concept. But then there are those stories which simply mirror real life in a straightforward way, following the small struggles and everyday events which push most people. Just Because! takes to heart that last category and never lets go. 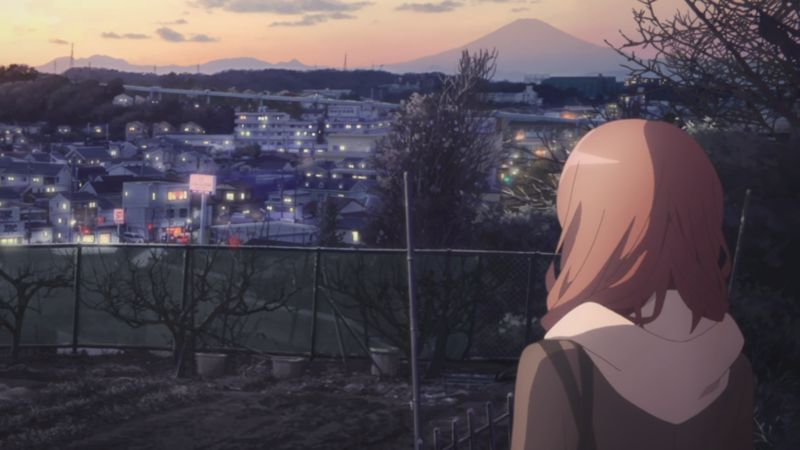 As the plot focuses on a handful of adult-bound teenagers who must deal with prospects and relationships, the anime revels in its mundanity. No bombastic dialogue. No ultra-exciting happenings. Only believable moments that beget a sense of realism which most people either relate with or otherwise understand firsthand. This approach can be a double-edged sword of sorts, for a plot of this nature can tread into dull territory if mistreated. Especially so in this instance when the school setting argues against it for lack of originality (despite being an original project in origin). The drama must therefore have an allure which elevates it to a worthwhile spot so that it may engage the audience with its content. Thankfully, this show discovers that allure. Very grounded and very personable scenes form a quiet direction whose sincerity supersedes any perceived dullness. Rekindling a friendship between two people who had grown apart in recent years. 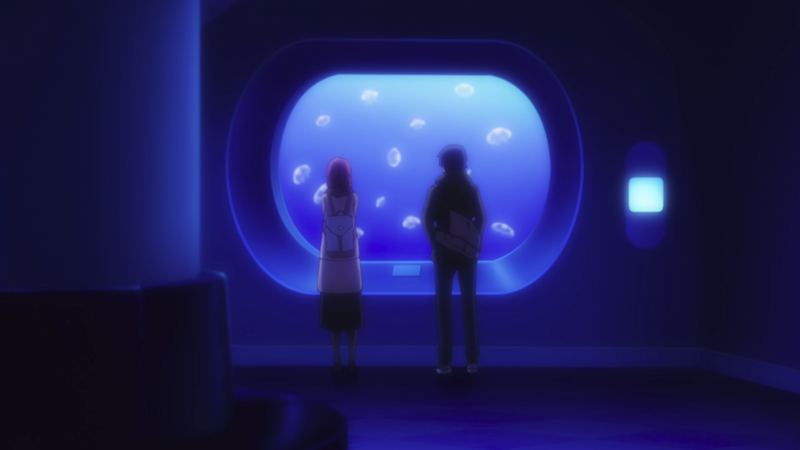 Visiting an aquarium as a group. Playing a poignant trumpet out by the river for all to hear. Quizzing someone on the train to calm their nerves. Getting someone a foodstuff from the nearby convenience store. On paper, these scenes appear mediocre at best, but, in practice within Just Because!, they highlight the anime and its ability to capture those mundane yet believable moments. A breakdown of the narrative, though, starts to unveil cracks in its makeup. Certain story beats – such as self-promises not being kept or wagers causing the same result regardless of their existence – do not matter as much as preordained. A grander theme fails to weave in-between those nice moments, too. It can get worse when Just Because! invites those two frustrating neighbors from down the bloc just past Romantic Avenue: Ms. Communication and Ms. Understanding. Their involvement prevents some delicious payoff throughout the entire season, and their combined might can even cause plain silliness when, for example, an obviously intelligent student not only amuses a “friend” where feelings are already known but also somehow cannot change the background of his own phone to avoid obvious confusion. Now, yes, these neighbors drive the plot and allow the necessary conflict to arise. However, for a story so presumably proud of its realistic portrayal, their arrival often replaces dramatic weight with induced eye-rolling. Thankfully, they aren’t so obnoxious that they outright ruin the show, for the consistent, deliberate events eke out at least a slight victory. Just Because! has a small debate which surrounds its visual acumen. Not in question: the atmosphere. A strong sense for lighting sets the mood quite well as somber thoughts and the unknown future cloud not only the wintery air but also the characters which carry this tone with them. 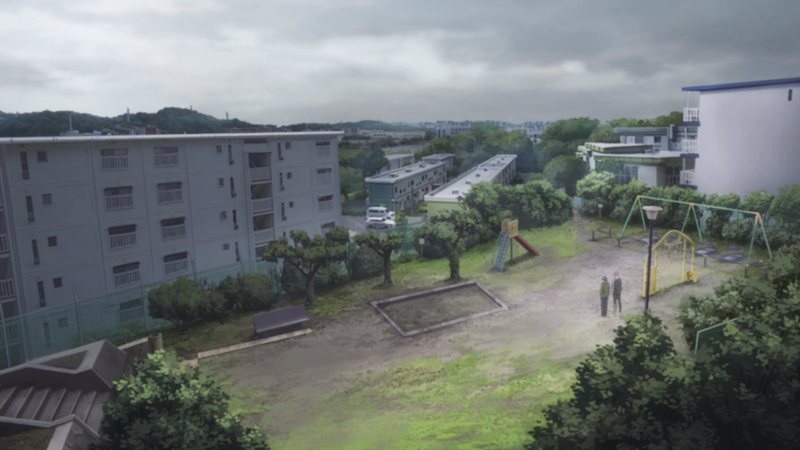 As for the background art, it dazzles amidst this cloudiness thanks to the constant establishing shots and realistic detail given to the many areas visited. Often, the audience feels as though they are there at the school, the surrounding city, and even within the homes of the characters as the show goes super out of its way to create a space alive with opportunity. The debate comes with the animation quality. On the one hand, its looseness leads to expressiveness, allowing for a larger spread of actions and reactions. On the other hand, it can get (very) rough on occasion and therefore not exactly pretty to look at, especially in contrast to the rest of the artistry. But it goes back to the realistic approach which Just Because! champions. How this expressive, rougher style coincides with the anime’s overall direction. Better yet, it lends itself to higher emotion and stronger purpose in the scenes depicted. If nothing else, it can be nice to see some risk now and again, and such is the case with this interesting decision here. Tougher to defend is the CG usage, but it’s infrequent enough that it doesn’t impede the show too much. And, while the color palate for the character designs may be too washed out, that aesthetic follows the grayer mood of the story. Plus, the simplistic looks of Eita and the others ensure that the realism levels remain right where they need to be. And this anime deserves a special shout-out for its phone and texting display. Letting the speech bubbles and stacking exchanges pop up near the characters as opposed to always focusing in on their phones was a neat choice. It gave Just Because! more chances to let the quietness and the normalcy of the visuals breathe, and so the debate deescalates again. Just as the story hugs docility, the cast members within Just Because! contribute to that same feeling. 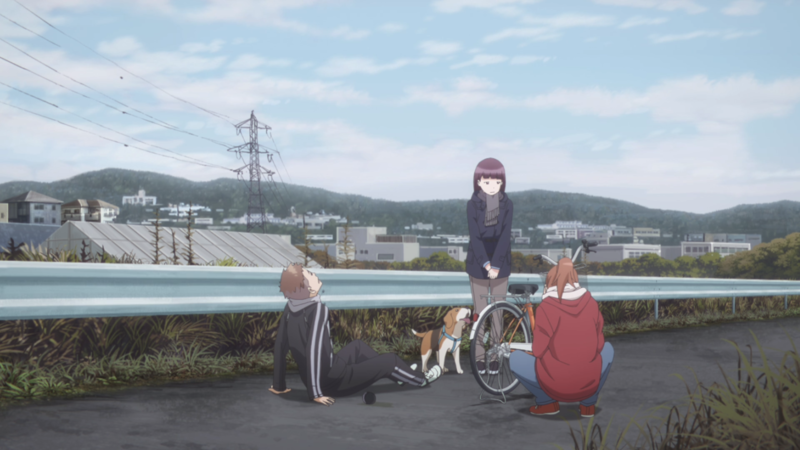 Eita, Mio, Haruto, and Hazuki do not necessarily pounce with fervor but instead contend with their personal predicaments in a subtle, reserved manner. Take Eita. Having been away for a while due to his father’s work, he must reacclimate himself with this familiar-yet-distant environment. Not just the area itself but the people too. Haruto, his once best friend. Mio, the girl he has always had a crush on. While he and they know each other, it isn’t until now that he puts in the effort to really know them on a deeper level. That doesn’t mean he overwhelms them with information or digs into their psyches. Rather, Just Because! follows their small conversations, their everyday interactions which create between them those lasting relationships which talking and understanding could only achieve. Be it running into Haruto out on the streets and asking questions about each other or apologizing to Mio (and her in turn as well to him) after the two took part in a small spat, these interpersonal moments allow them and their connections to grow. It can also be seen in the other relationships. 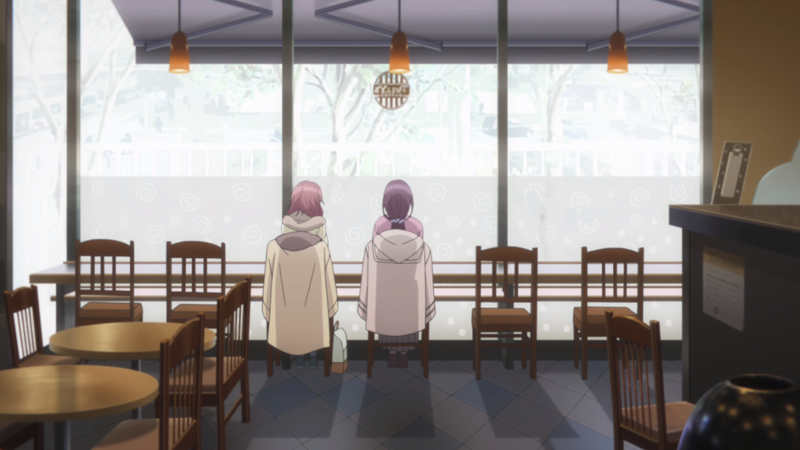 Hazuki and Mio chat together at a quaint café or in a secluded spot of the school as they discuss feelings and futures. Haruto and Hazuki have an aside all to themselves on the local baseball field. Mio confronts Haruto about her own thoughts (with eraser in tow). And they all meetup to have a warm, hearty meal to combat the cold weather, taking comfort in the friendships they currently share. All the while, as these interpersonal problems play out, they face their individual issues with that same sense of subtlety. Eita chooses to ignore the flow, not letting the leisure of life keep him sedated. Mio stops making excuses and realizes that hard work can pay off. Haruto picks up tons of courage, fights his fears, accepts compromise, and promises to do what he can. And Hazuki begins to think less about what others want and, through makeovers and introspection, starts to think about what she needs as well. Altogether, Just Because! creates in these characters a theme of agency for them to embrace. It doesn’t always manifest in quite the same manner between the lot, but that docile drive to forge their own path rings true. Given the premise, how they are becoming adults very soon and must therefore grasp such independence, this theme gives the anime strength of writing throughout most of the season. The odd one out, then, is Ena, for she already has that agency. An outsider to this group, and, indeed, only really ever interacting with Eita, she’s a go-getter through and through. Her ideas, her photography, her emotions, her words. Ena may be difficult to handle at times, but her self-understanding arguably puts her above the rest when it comes to reaching adulthood. Which is why her outcome in the love triangle ends up as one of the most intriguing parts of her arc and the anime at large. The denial comes off as a semi-surprising decision but a realistic one at that. Even better, it juxtaposes with the others in the cast. That having that agency and going for it all does not always equate to success and to happiness. Perhaps it goes against the spirit of Just Because! : because everyone else lives happily ever after (more or less). But loss is yet another means of growing up. 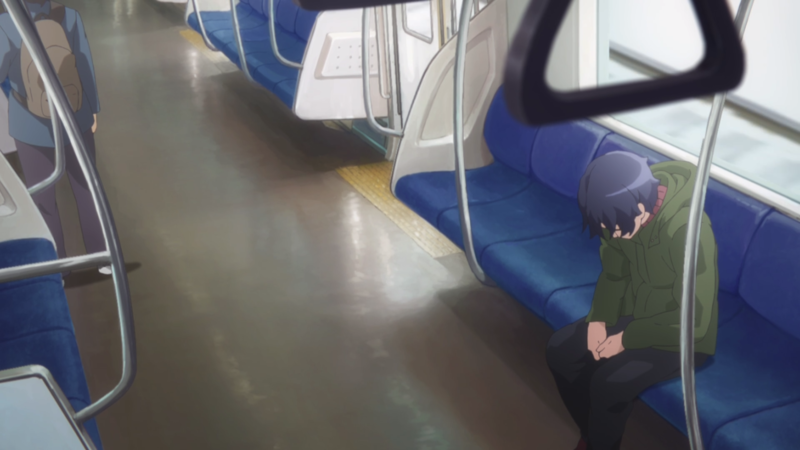 With a story centered on characters experiencing precisely this transitional phase, this sad outcome fits right alongside the strong character writing present in Eita, Mio, Haruto, and Hazuki’s own arcs. Unfortunately, this anime hits a few walls regarding the audio elements it includes. Within the OP, titled “over and over”, the piano flourishes and parts of the vocals get at that poignant feeling which Just Because! adheres to. Yet the fast pace contradicts the flow of the show, other parts of the vocals sound flat, and whatever energy it tries to go for gets lost along the way in its straightforward presentation. “behind”, the ED, fights back against its title by moving ahead of its OP counterpart. A mid-tempo pace and a slew of ambient effects give this at-times gentle, at-times empowering song a solid foundation. The harmonized vocals, the return of that piano, and the orchestral edge push it further ahead as well. The original soundtrack has both its positives and its negatives. While it can have a couple of nice melodic tunes, some of its more slice-of-life offerings are way too all-over-the-place, making for an unfitting listen that clashes with the subdued vibe of the show. A couple of the voice-acting performances attempt a save even if nobody exactly knocks it out of the park. Taishi Murata as Haruto brings forth enthusiasm and gleeful responses. And Lynn (her full name given on database sites) as Ena overbears others with her loud, persistent speaking but can also lay bare her softer, emotional side. Aoi Ichikawa as Eita may not have had the most skilled or impressive performance, but, given that it was his first ever role in the medium – and the main lead at that – he deserves a little leeway as he sharpens his craft in future projects. In total, they do not completely falter, but the audio elements within Just Because! at least seem to be some of its weaker facets. It probably comes as no surprise that I’m a big fan of these mature dramas. “Mature” defined here as “focusing on a believable cast with a realistic backdrop and grounded conflicts.” I’m all for stories with lots of action, a comedy side, or a fantasy angle. But I also gravitate towards these intriguing replications of the human condition. For this reason, I liked this anime despite some of my grievances. While not a “slow burn” per se, watching the events play out in such a calm, normal manner was not only a nice change of pace but also a mellow experience. It would be fair to say that this tale roots itself too much in non-excitement since almost no parts of it truly stick out as memorable, but its consistency and care within the narrative are positives to me. On the characters themselves, some were favorable and a few not so much. Haruto was a good dude, and I admired his attitude when dealing with his situations. Mio didn’t do a whole lot in the anime, but she was cute and likable nonetheless. And Yoriko, the runner girl, was a nice person to have around, too, if only for her wing-girl helpfulness. I didn’t much care for Eita, though, for I found him devoid of any interesting motifs. 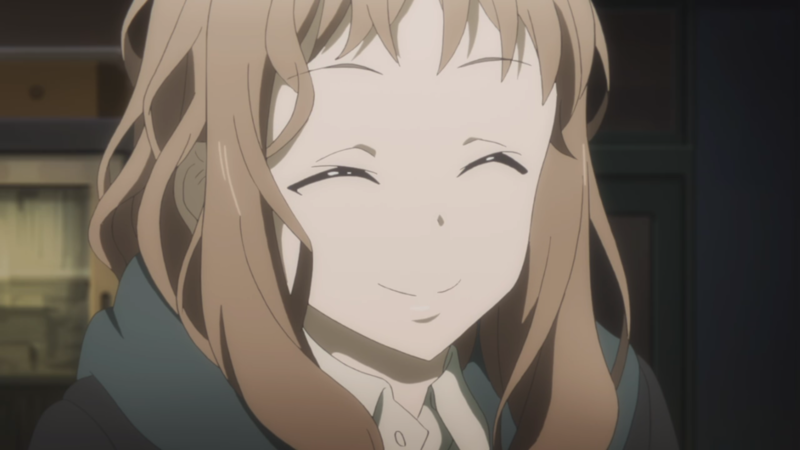 I wanted to like Hazuki more, but she didn’t have the presence or the impact to get me fully on her side. Indeed, her slight aloofness made me sad to see. Most of my dislike, though, comes from Ena and her wedging herself into the situation. I know that that’s her personality, and it’s only fair that she has a shot at love like the rest of them. However, she got on my nerves more and more as the season progressed because she just wouldn’t let up and pushed things in a semi-selfish manner. However, credit where credit is due on the show’s part: The last episode had me antsy, agitated with how long it was prolonging its final reveals. It knew what it was doing, and it did it well, for I shouted at the screen at least once, pleading with the anime to “get on with it already” (or another such similar phrase). So, kudos to the show for having me invested in its proceedings. Doubly so for giving me the ending I was personally rooting for. I will say, though, that I would have preferred greater justification for the winner since their romantic relationship isn’t the most electrifying. The idea is that their future together now will expand on their love for each other, but this story didn’t heavily involve such a throughput, and we the audience will (presumably) not be getting to see it unfold anyway. Either way, as the title implies, a two-word phrase is sometimes the only retort required. Just Because! holds a lot of ambition and capitalizes on a few of its ideas. A realistic premise, strong artistry, and a meaningful thread for its characters battle against plot problems, sufferings in the musicality, and some missing excitement. But, if it were to earn a grade, it still passes.